I always wear white after Labor Day, guys. I wouldn't have it any other way. 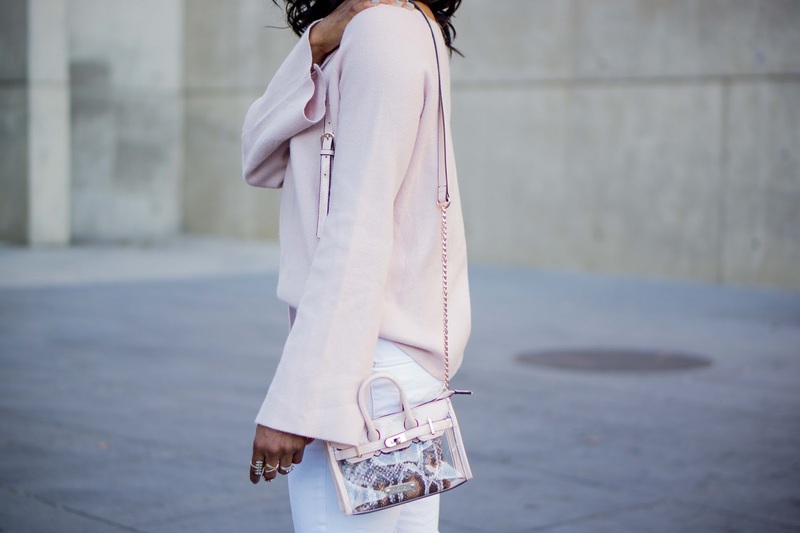 And I couldn't think of a better top to go with these white jeans other than this beautiful blush tone sweater with bell sleeves. I mean, seriously, how fun are these sleeves, though? I really wanted to wear the heck out of this top, but sadly, it was like 80-something degrees that day. But I think now that we're in October, I can finally get the 60-70 degree temperatures that I need to get my fall layering on. What's your favorite thing about autumn, muses? 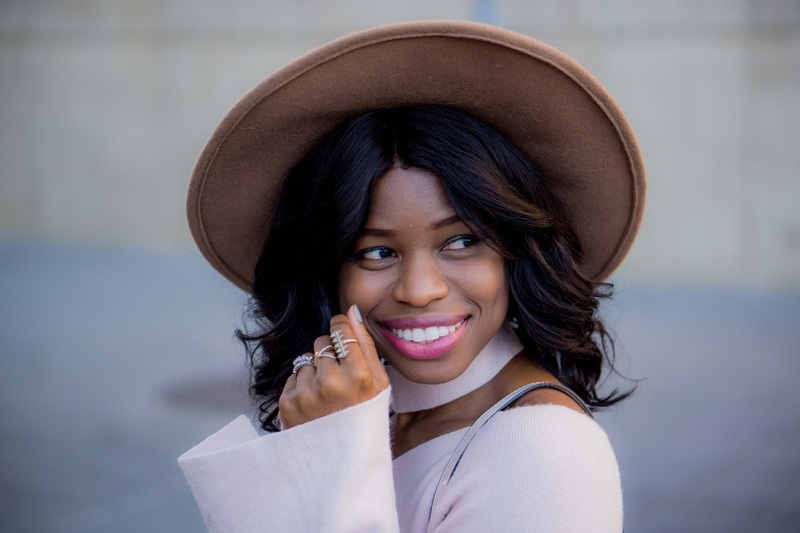 Is it the ease of layering (my fave), or the fall foods and drinks? Maybe it's the return of your favorite TV shows or the start of the holiday season? Whatever it is, let me know in the comments below and happy first post of October! And today is the Monday Mingle Linkup that I host with Momtrends and Take Time for Style! The linkup is hosted at Momtrends today, so go add your post! So love this color combo and that little clear bag is so cute. My favorite is how I can just walk outside feeling comfortable. Although, that weather is very short lived in Chicago. Your top is beautiful! I love the color! Ooh I love those sleeves! I just bought an off the shoulder top in the same shade - love it! Great outfit! Love that top! My favorite part of fall is the fall colors in nature. You are beautiful. Wow. I'm such a sucker for these light, feminine tones. Totally stealing this look! 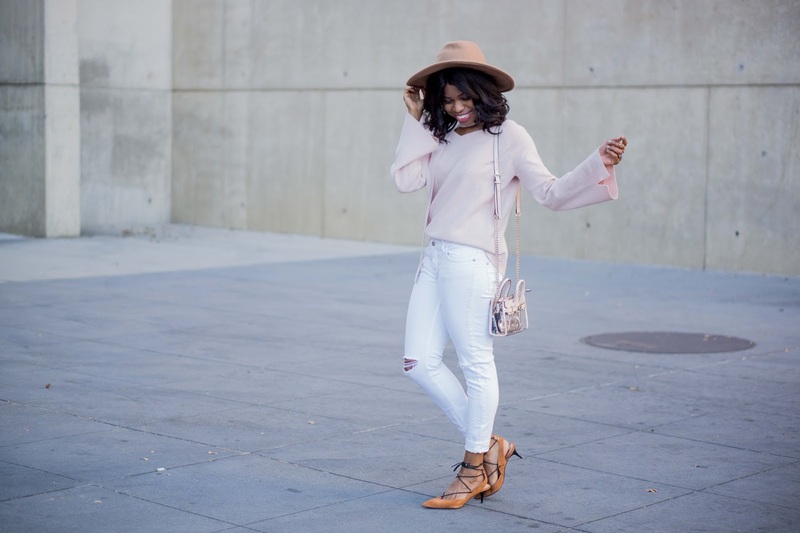 Blush hues are everything this fall, you killed this outfit!! Can I just say WOW ! 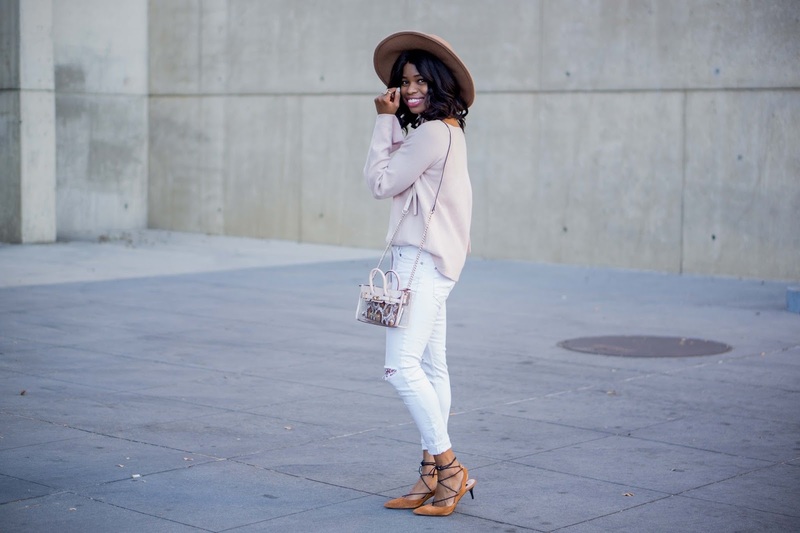 Oh yes on the white jeans (I LOVE WHITE JEANS) and that blush bell sleeve is fabulous, that color suits you ... I'd wear this look in a heartbeat. Stunning! That blouse is so gorgeous and a fabulous color on you! I love those light pastel colors together! Your shoes are such a great pop! Beautiful outfit! What an awesome title for an awesome look! 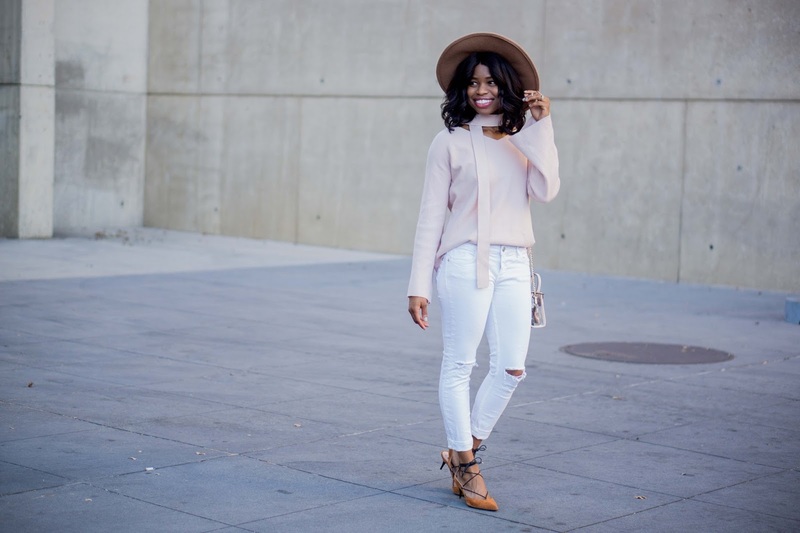 Gorgeous look and so perfect for bringing those white jeans into fall. I think my favorite thing is wearing layers--it's nice to have a little chill in the air after a hot summer! OMG, gorgeous lady!! Love this entire look and your bag is fabulous! Love this color combo and those bell sleeves are perfect. You look so gorgeous Cheryl and this look is super cute!